A urban waterfront that's surrounded by natural beauty. 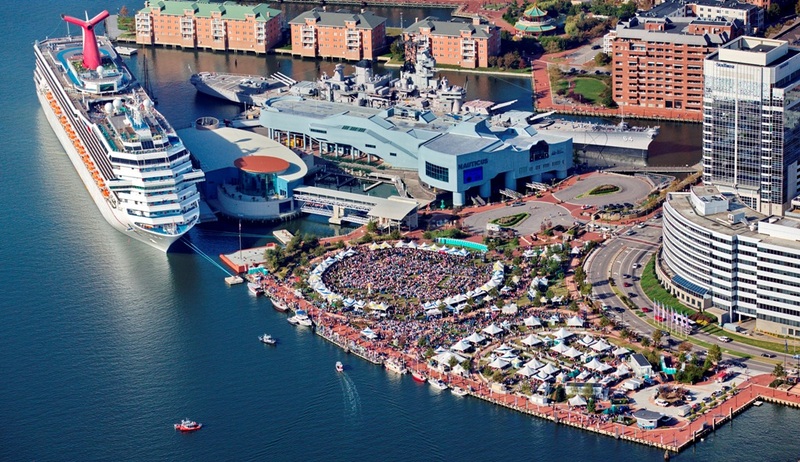 Downtown Norfolk boasts an authentic, breathtaking, and accessible urban waterfront, offering unmatched views and uses. From daily harbor tours and tremendous public festivals to the scenic Elizabeth River Trail, the Downtown Norfolk waterfront has something for everyone, all just steps away from a bustling and vibrant Downtown, complete with delectible dining, unique shopping experiences, top-tier arts, exciting nightlife, and a robust events schedule. To see all that Downtown Norfolk has to offer, check out the rest of DowntownNorfolk.org! Harbor Park is proud to be the home of the Norfolk Tides, the Baltimore Orioles AAA baseball team. 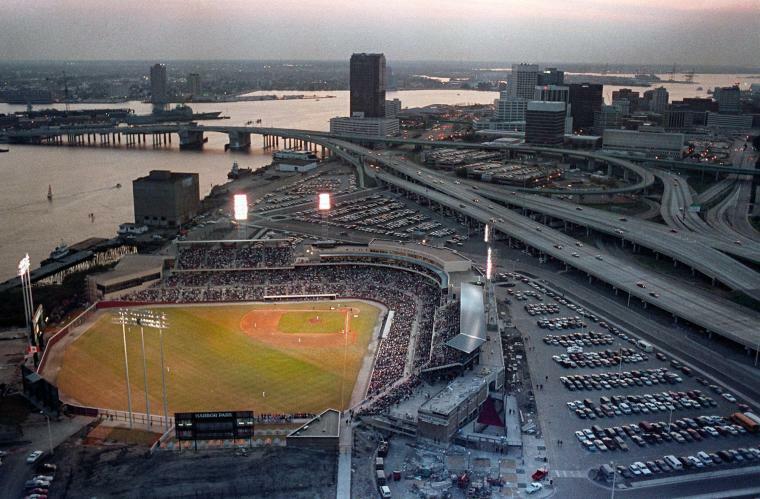 Nestled on the Elizabeth River waterfront, the 36-acre Harbor Park also hosts NCAA baseball and concerts. The 12,067 seat stadium boasts 20 luxury suites, press facilities that include two TV broadcasting booths, and a 300-seat restaurant. Harbor Park also features a complete picnic area for private parties, as well as an exceptional variety of concession food and beverages for stadium guests. Norfolk's only waterfront hotel, the Sheraton Norfolk Waterside Hotel offers the best of both worlds, with uninterrupted waterfront views of the Elizabeth River and beautiful views of vibrant and unique Downtown Norfolk. 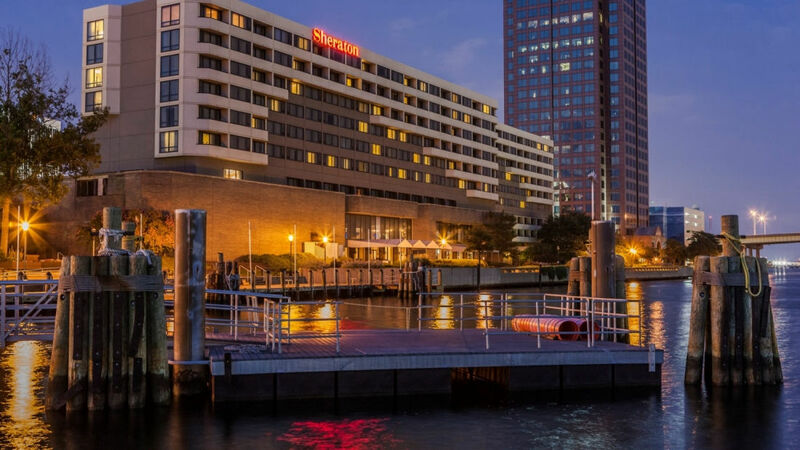 The Sheraton Norfolk Waterside Hotel is positioned on the riverbank Downtown, just steps from Waterside District and diverse shopping, dining and entertainment on Granby Street and year-round concerts and festivals at the Town Point Park waterfront esplanade. With 46,000 square feet of modern meeting and special event space, highlighted by the Merrimac Ballroom, overlooking the harbor through floor-to-ceiling windows, as well as a range of spacious, pet-friendly rooms and suites to meet any need, Sheraton Norfolk Waterside Hotel is equally suited for business or leisure stays. Discover how good life on the water can be. 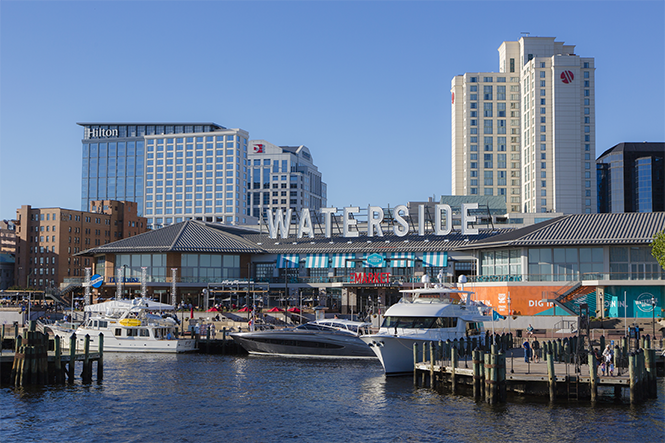 Located in the heart of the central business district and adjacent to the City of Norfolk's world class waterfront and festival site Town Point Park, the Waterside District is a central gathering place for local residents and visitors. A $40 million overhaul and rebranding of Norfolk's iconic Waterside Festival Marketplace allows visitors to enjoy the best national, regional, and local restaurants and offers live music, festivals, and more in an atmosphere that integrates Downtown with its glorious waterfront. HRT’s Elizabeth River Ferry is a system of three 150-passenger paddle-wheel ferry boats. 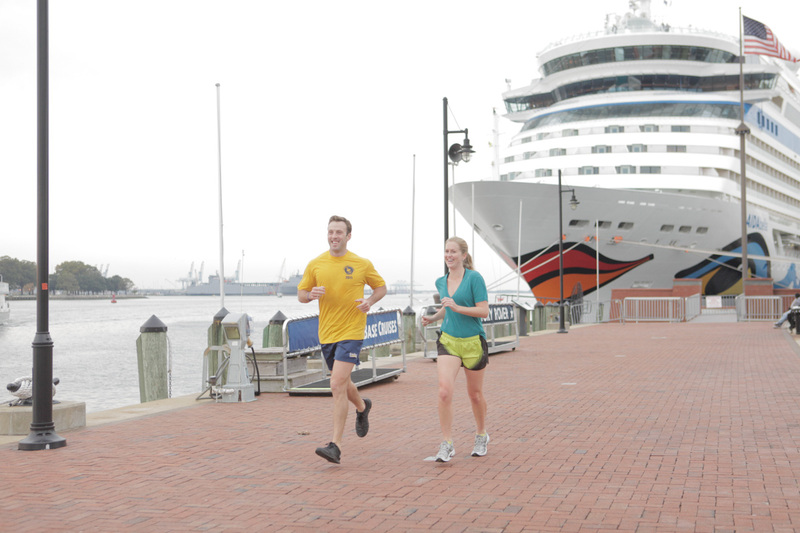 The Ferry travels from Downtown’s Waterside Marina to two locations in Olde Towne Portsmouth. The Ferry is wheelchair accessible and allows passengers to walk on with their bicycles. For route schedules and general information, call 757-222-6100 or visit gohrt.com. Dial 711 for TTY. The beautiful interactive fountain in TowneBank Fountain Park, situated alongside Waterside Marina and Waterside District, bookends Town Point Park and Nauticus. The responsive fountain is a great way to cool off from the summer heat, entertaining visitors with daily performances of 28 water jets shooting water up to 12 feet into the air and enhancing its nighttime performances with illumination. The park also features comfortable seating, shade, and lawn games. Town Point Park is the People's Park. Anchored at both ends with attractive fountains, this beautiful waterfront park provides eight acres of peaceful outdoor spaces located on the riverbanks of the Elizabeth River, right in the heart of the Downtown Norfolk business district. Town Point Park is more than a premier waterfront park with incredible views of the Elizabeth River harbor: it is a social space where friends meet, eat lunch, chat, stroll, listen to music, work on the wireless network, or simply relax, taking a break from a busy schedule. 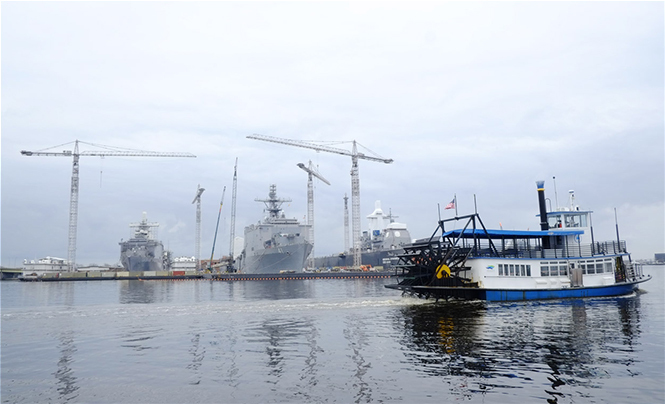 Town Point Park is also an epicenter of activity, hosting a 10-month schedule of award-winning festivals, concerts, military tributes, tall ship visits, holiday programs, and recreation and athletic events. A variety of public art elements are placed throughout the park as well, including the Armed Forces Memorial, the Homecoming statue, a restored 19th century cannon retrieved from the river, a large Navy anchor, and a new installation of tiled images capturing Norfolk's military and maritime past. The Elizabeth River Trail is a 10.5 mile urban biking and pedestrian trail along the Norfolk waterfront, maintained and marketed by the Friends of the Elizabeth River Trail Foundation with support from the City of Norfolk. The Foundation aims to enhance and expand the trail as a recreational, social, and educational destination that improves environmental awareness, neighborhood connectivity, and innovative economic development in Norfolk, Virginia. The Trail can be accessed at various points along the Elizabeth River including Town Point Park, Harbor Park, and the historic Freemason District. The trail offers scenic views of the Elizabeth River and interpretive markers tell the history of the area and environment. Located on Downtown Norfolk's waterfront, Nauticus is an exciting 120,000 square foot science and technology center exploring the power of the sea. It is also home to the USS Wisconsin, one of the largest and last battleships ever built by the U.S. Navy. From Escape Ship challenges, Dickens' Christmas Towne, camp programs, and informative exhibits, to Haunted Battleships and scavenger hunts, there’s always something new and exciting happening at Nauticus. 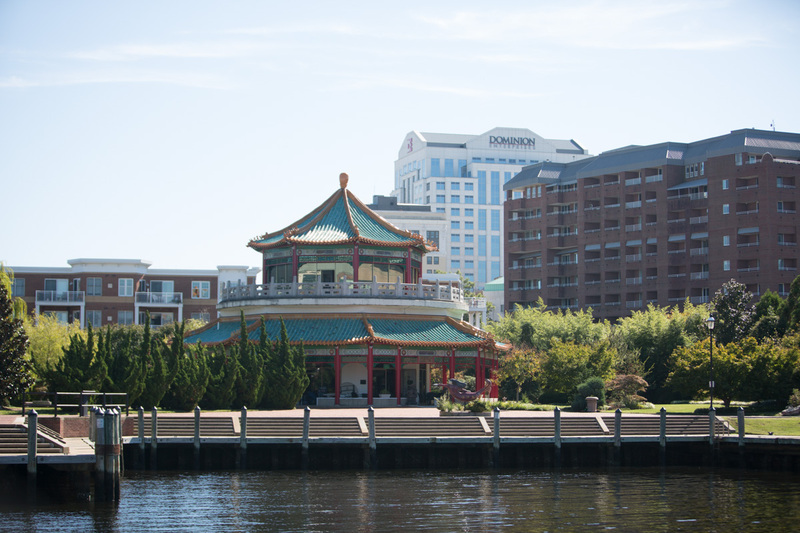 Located on the Downtown Norfolk waterfront in Freemason Harbor, The Marine Observation Tower, also known as the Pagoda, is the centerpiece of the tranquil garden, a serene oasis where East meets West on more than an acre of urban space. This peaceful respite, just minutes from the bustling city activity, features gateways embraced by gentlly swaying bamboo, winding walkways perfect for strolling, and exquisitely arranged landscape of plants, water, stone and architectural features. This unique spot provides a panoramic view of the beautiful garden, the USS Wisconsin, a restaurant, and sunsets over the Elizabeth River; views along the path framing the Pagoda change by season, revealing a layered beauty of both natural form and culture. For even more of what Downtown Norfolk's waterfront has to offer, please explore the rest of DowntownNorfolk.org.